Call the shelter and ask for Frankie. "Oh, the acrobat?" the woman at the front desk drawls. The Humane Society of North Texas is a sprawling operation, saving scores of animals in need every day. But everyone knows Frankie. The acrobat. The escape artist. The dog who just wants to get out so badly, he actually scales chain-link fences. "He looks like he's freaked out," Whitney Hanson of the Humane Society of North Texas tells The Dodo. "But he was wiggling up there. He was wagging his tail. He didn't want get down. "He was very proud of himself." Frankie's previous owner didn't seem to share his flair for escapism. 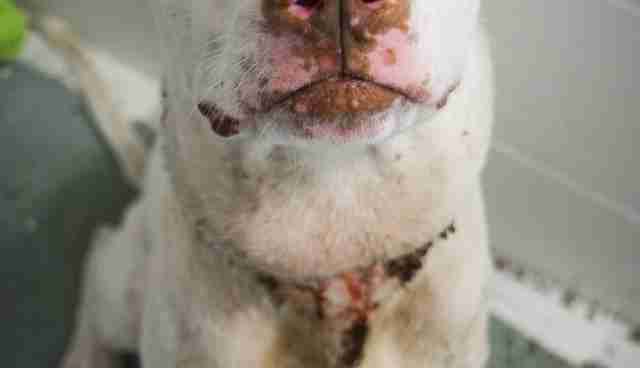 When he was rescued, the one-and-a-half-year-old was in the permanent chokehold of a tragically tight collar. Frankie had to immediately undergo emergency surgery thanks to a collar that was buried "several inches under his skin." Maybe that's why Frankie became an escape artist. Because he's never found a place he could call home. 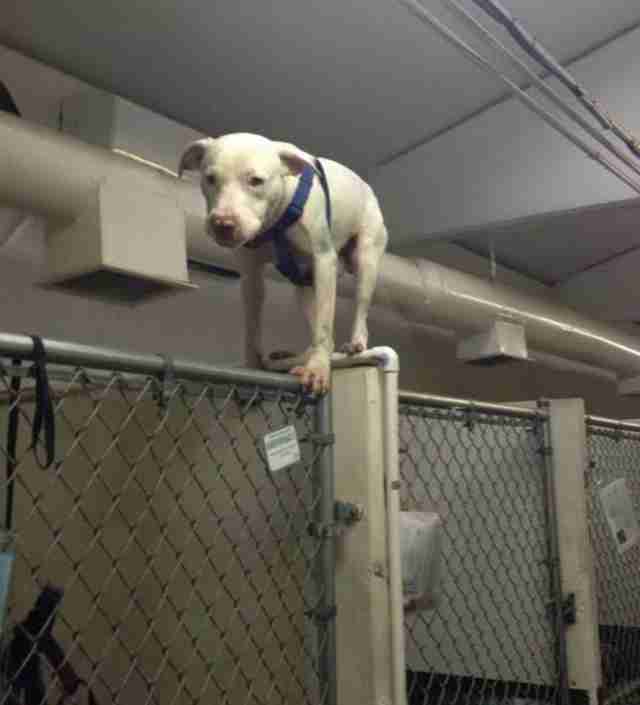 When staff at the organization's East Lancaster shelter found Frankie balancing precariously on the edge of his kennel, they immediately took him down. Now, his kennel has a chain-link ceiling. That's a lot of chain for a dog who, by all accounts, is exuberantly friendly and eager to please - a pit bull mix who is all about kisses and wiggles. But maybe that's also part of Frankie's escape plan. "He's a staff favorite here," Hanson says. "Everyone on the staff knows him and loves and is rooting for him." If you fall in love with him, you might be able to break those chains for good. Fortunately, Frankie is not on death row. "Once an animal enters our adoption program, they are only euthanized for severe medical or behavioral issues." Hanson says. But a shelter, no matter how much the staff loves their little escape artist, is not a home. Frankie probably knows that too. Think you can give this little escape artist a chance at real life? Visit the Humane Society of North Texas. Or call 817-332-4768.